From cowboys' denim to the jeans in your wardrobe, its enduring popularity survives to this day. In this practical and inspirational handbook, learn how to use this powerful pigment to breathe life into your clothes and craft projects. 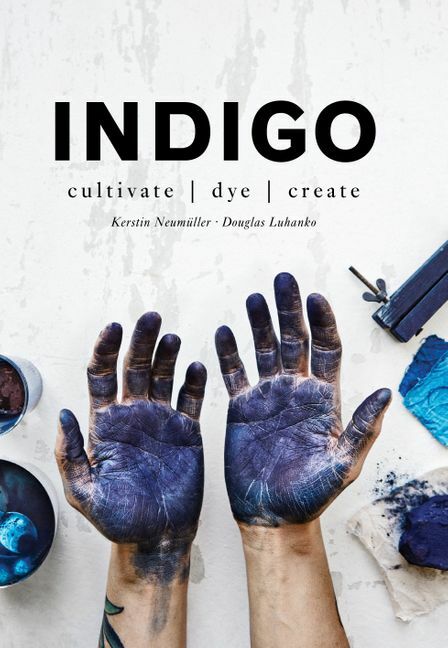 This book contains all the information you need to grow, extract and use indigo, alongside a wealth of dying recipes with other plants and gorgeous textile ideas. In the first chapter, learn how to grow indigo yourself, whether you have a windowsill or a full garden. No matter where you live, the authors provide gardening tips for the best species of indigo for your area. From there, a variety of different dyeing techniques are explained to achieve your desired results. Covering everything from warm or cold dyeing with indigo, fructose, hydrosulfite and fermented vats, and dyeing with other colour pigments, you can create multi-coloured projects that are bound to astound. A chapter explaining the science behind the dye also takes you through any troubleshooting problems to help you experiment further. Finally, the projects section includes guides on how to use your dyed textiles to create intricate moyo-sashi and hitomte-sashi embroidery, patchwork quilts or resist-dyed patterns. Weave using traditional ikat or boro techniques and dye beautiful honeycomb, storm and geometric patterns. Take your ideas to the next level with this potent dye. Douglas Luhanko has a passion for denim and indigo. Both he and Kerstin Neumuller run Second Sunrise, a raw denim menswear boutique in Stockholm and also manufactures jeans in his own company Blue Highway. Kerstin Neumuller is a men's tailor with her heart in handicrafts. She has spent many years studying handicrafts and the history of textiles. Together, she and Douglas Luhanko run the shop Second Sunrise in Stockholm.